412 pages | 12 Color Illus. | 63 B/W Illus. In the World Library of Psychologists series, international experts themselves present career-long collections of what they judge to be their finest pieces - extracts from books, key articles, salient research findings, and their major practical theoretical contributions. 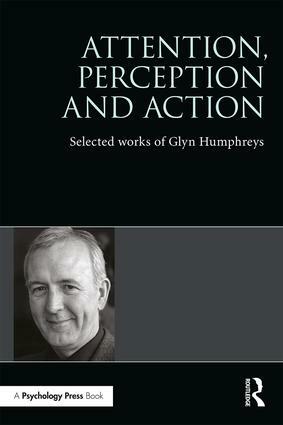 Glyn Humphreys is an internationally renowned cognitive neuropsychologist with research interests covering object recognition and its disorders, visual word recognition, object and spatial attention, the effects of action on cognition, and social cognition. Within the field of Psychology he has won a number of prestigious awards, including the Spearman Medal, the President’s Award of the British Psychological Society, and the Donald Broadbent Prize from the European Society for Cognitive Psychology. This collection reflects the different directions in his work and approaches which have been adopted. It will enable the reader to trace key developments in cognitive neuropsychology in a period of rapid change over the last thirty years. A newly written introduction contextualises the selection in relation to changes in the field during this time. Attention, Perception and Action will be invaluable reading for students and researchers in visual cognition, cognitive neuropsychology and vision neuroscience. 1. A case of integrative visual agnosia. (1987), Riddoch, M.J. & Humphreys, G.W. 2: Cascade processes in picture identification. (1988), Humphreys, G.W., Riddoch, M.J. & Quinlan, P.T. 3. Visual search and stimulus similarity. (1989), Duncan, J. & Humphreys, G.W. 4: Early orthographic processing in visual word recognition. (1990), Humphreys, G.W., Evett, L.J. & Quinlan, P.T. 5. Non-spatial extinction following lesions of the parietal lobe in humans. (1994), Humphreys, G.W., Romani, C., Olson, A., Riddoch, M.J. & Duncan, J. 6. Visual marking: Prioritising selection for new objects by top-down attentional inhibition. (1997), Watson, D.G. & Humphreys, G.W. 7. Seeing the action: Neuropsychological evidence for action-based effects on object selection. (2003), Riddoch, M.J., Humphreys, G.W., Edwards, S., Baker, T. & Willson, K. 8. The left temporo-parietal junction is necessary for representing someone else’s beliefs. (2004), Samson, D., Apperly, I., Chiavarino, C. & Humphreys, G.W. 9. Dissociating the neural mechanisms of memory-based guidance of visual selection. (2007), Soto, D., Humphreys, G.W. & Rotshtein, P. 10. Ignoring the elephant in the room: A neural circuit to down-regulate salience. (2010), Mevorach, C., Hodsoll, J., Allen, H.A., Shalev, L. & Humphreys, G.W. 11. The attraction of yellow corn: Reduced attentional constraints on coding learned conjunctive relations. (2013), Rappaport, S.J., Humphreys, G.W. & Riddoch, M.J. 12. Coupling social attention to the self forms a network for personal significance. (2013), Sui, J., Rotshtein, P. & Humphreys, G.W. 13. The BCoS cognitive profile screen: Utility and predictive value for stroke. (2015), Bickerton, W-L.,Demeyere, N., Francis, D., Kumar, V., Remoundou, M., Balani, A., Harris, L., Williamson, J., Lau, J.K., Samson, D., Riddoch, M.J. & Humphreys, G.W. Glyn Humphreys is Watts Professor of Experimental Psychology at the University of Oxford, UK. The World Library of Psychologists celebrates the important contributions to psychology made by leading experts in their individual fields of study. Each scholar has compiled a career-long collection of what they consider to be their finest pieces: extracts from books, journals, articles, major theoretical and practical contributions, and salient research findings. For the first time ever the work of each contributor is presented in a single volume so readers can follow the themes and progress of their work and identify the contributions made to, and the development of, the fields themselves. The distinguished careers of the selected experts span at least two decades and include Barbara Wilson, Elizabeth Valentine, Leo Hendry, Jonathan St. B.T. Evans and Mark Griffiths. Each book in the series features a specially written introduction by the contributor giving an overview of his career, contextualizing his selection within the development of the field, and showing how his own thinking developed over time.